In the fall of 1960, the writer John Steinbeck climbed into a pickup truck with a makeshift camper on top, and started driving. He and his Standard Poodle, Charley, roamed for three months and ten thousand miles, completing a circuit from one coast to the other and back again. Steinbeck’s account of the journey, Travels with Charley In Search of America, was published in 1962, the same year he won the Nobel Prize for Literature. 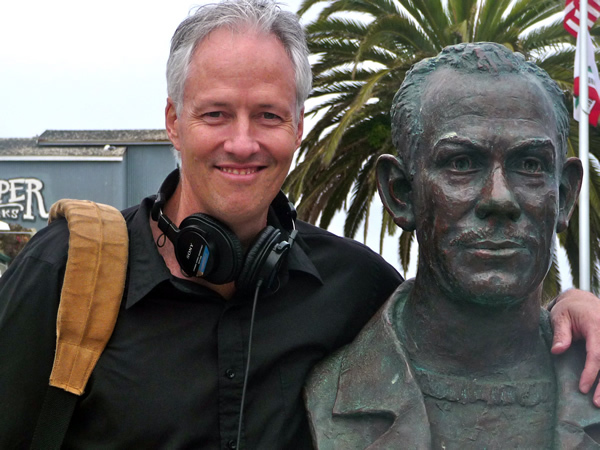 A half-century later, radio producer and CDS audio program director John Biewen visited some key locations on Steinbeck’s itinerary, traveling not with a dog but with a microphone—Mike, that is. In each location, he collaborated with an artist who lives and works in that place. Travels with Mike comprises a series of conversations, across time, between a great American writer and a diverse array of contemporary artists—conversations about place and the spirit of the country. Listen to Travels with Mike on PRX. Visit the Travels with Mike website.